Black bears are the most challenging animals to judge for trophy quality in North America. Many hunters shoot less than average black bears since they aren’t educated on how to field judge a bear. If you follow the 5 points below, it will allow you to distinguish the difference between an average bear and a trophy black bear. First off we must distinguish what a trophy black bear is, for some people a trophy is any bear regardless of size. Others it is a Boone Crockett skull and/or color phase. Here at TOA we classify a trophy black bear as a mature boar, over 6 years old with a good quality thick hide. The bear will measure from six to seven and a half feet from nose to base of tail. 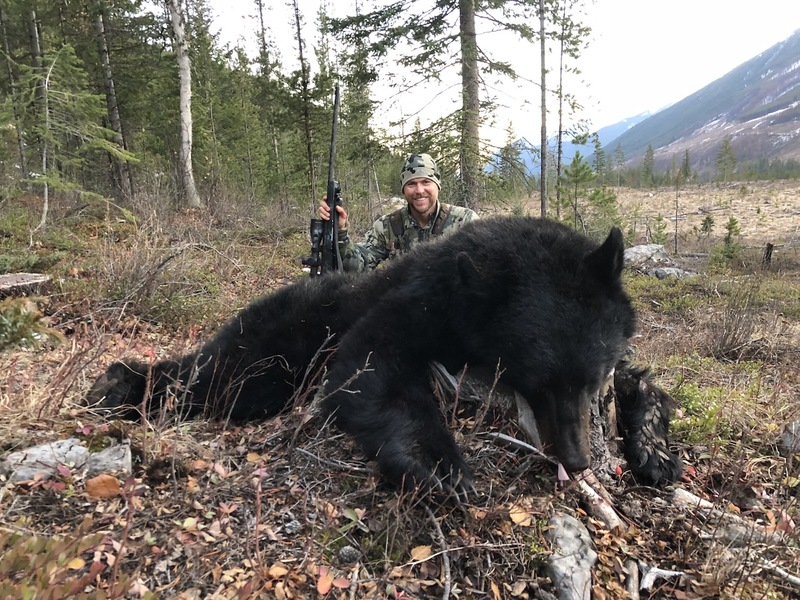 The skull will measure over 17 ½ inches B&C points, besides the sheer size of a black bear half the trophy is in the hide. Spring bears have the thickest hair, the hair will be around 4 inches in length. 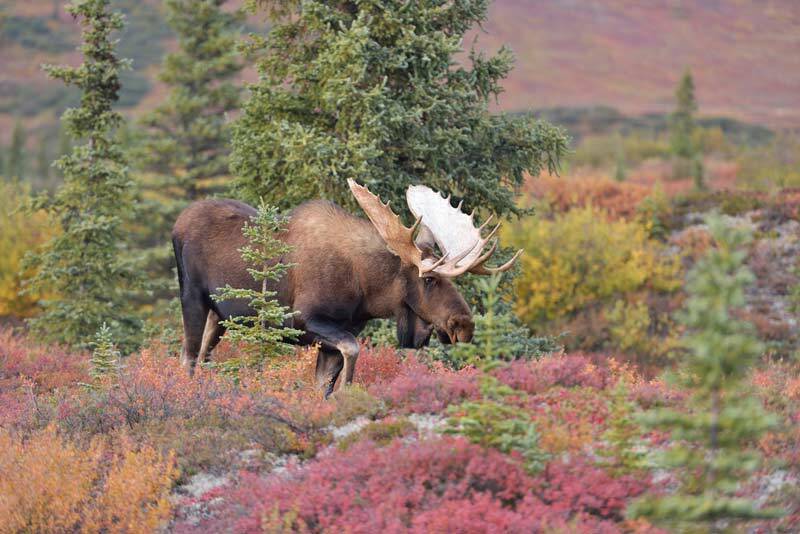 Color phase is a highly sought upon trophy for many, whether it’s a blonde, red, chocolate or silver phased bear. A big bear will look like the belly is touching the ground, a bear under 6 feet will have 12-20 inches between its belly and the ground. This rule however has exceptions; a very young bear (3 years and younger) will look round and full cause it has not fully matured yet. Many people misjudge bears when they only look at one feature and not multiple. 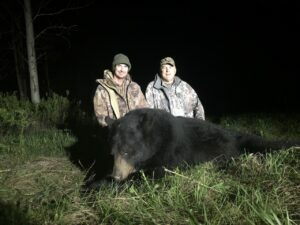 This is the easiest size way to tell the trophy quality on a black bear. The general rule of thumb is if the ears look big then it’s a small bear, if the ears look small and far apart from each other then it’s a big bear. If he is aware of you and looking your way, his ears won’t stand up on top of his head like a dog’s ears, they’ll seem to be aimed out to the side of his head. A Mature Boar has a 7 to 10 inch gap between their ears. A big bear (boar) will have a deeper, wider and longer snout than a smaller bear or a female. A big bear will have well developed bulging muscles on the top of his head. Probably the hardest way to judge a bear is trying to estimate the length from head to tail. Here’s a few tips on making for judgment a bit more accurate in the field. DO NOT use binoculars if the bear is within 250 yards, all bears appear to look larger when binoculars are used. A naked eye is the best way to judge a bear at shorter distance. Secondly use something as reference, whenever I go on a road I measure how wide that road is. Every time I am hunting a cut block I measure how tall the replanted trees are and the width of the stumps. Using something to reference in the area of the bear is a huge help, it can make the decision quicker and with more confidence. If you watch a bear come out in a field/opening and its nervous or scared to eat and be there then don’t shoot this bear. IF a bear is timid to eat or be in the open then it is a small bear. That bear is scared because a bigger bear most likely a big boar is in the vicinity, when that big bear walks out it will walk around like it owns the place, it won’t show any nervousness and will eat comfortably. If a small bear is out when the big one comes out then the small bear will run away immediately. The least known way to judge a bear is the shape of their front shoulders when looking face on. The bear needs to be facing you preferably walking, if the shoulders look tight and skinny then its small bear. A large bear is going to have a very broad set of front shoulders, they will look wide and its stride will be offset side to side. His whole body will move horizontally with every step. A small bear will have a very streamline and straight walking pattern. Bigger bears generally walk with their heads down and not look around when it’s not pressured. Now if the bear is walking from you say on a road, look at the shape of the rump. A small bear will have a triangle shaped rump whereas a mature boar is going to have a horse shoe shaped rump.